Visiting Rotarians: Kathleen and Mary from Palm Desert; Dawn Addis and her family from Los Osos; Leonard with Los Osos Rotary who was peddling raffle tickets; Max with his parents and younger brother; Deepa; and Stella, our Junior Rotarian. 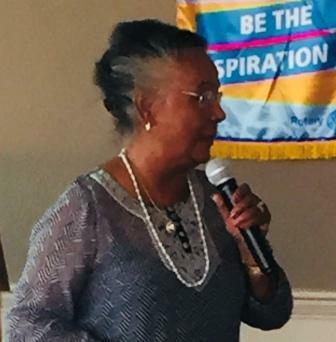 Guests of Rotarians: Emily, with Judy S.; the Browns who also work with Judy on Human Trafficking; Bonnie Jones; Judy’s daughter, Jody; Gary Owens brought his son, Mike; Paige who came with Elsie for the second time. John Weiss announced that he has filed papers and plans to run for Mayor. Judy S. and Bonnie Jones will have tickets available for the Human Trafficking Summit today and from now on. We still need help for the Avo/Marg Festival; let Jamie know if you are available to help. We have about 30 volunteers, we need 50. Next we gave a birthday gift of a homemade apron to Lawrence, Max’ mom; Katherine G also brought a beautiful cake for her. She said she had never had a cake before; Max’s family spoke in French, translated by Max, thanking our Club so much for everything we have done for his family. They awarded our Club a financial gift to help with all of the things we do. Next Max thanked us very much for all our Club has done for him. Max is a special person, we have all benefited from knowing him and I’m sure we will continue to follow his life. His brother, Clarence is just eight years away from being able to come here as an Exchange Student. John Weiss introduced Deepa, our very special speaker today. 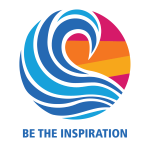 This year’s theme for Rotary International is “Be the Inspiration”. Our world has many problems including poverty and human trafficking. Peace is not just the lack of war. Two million girls are sold each year into human trafficking. On the Central Coast, Human Trafficking is associated with gangs, the hotel industry, and the farming industry. Deepa says if you can get girls into school, you can change the course of a nation. Deepa’s school brings pride, laughter and hope to the girls. They have an After School Enrichment Program. The girls at PACE have an opportunity to write their stories and then act them out in front of the perpetrators. Deepa’s organization has brought in fruit trees, put in sanitation, built roads, and brought in electricity. Why does Deepa have such a passion to help? She wants to Change the Face of Hopelessness and Fear. Deepa is having a fundraiser at her winery with all proceeds going to support her school for girls. We would like to have as many of us as are able go down to Solvang to support Deepa’s efforts. More details next week. We awarded Deepa with a check that will cover expenses for two girls in her school. She also brought, and sold, many beautiful handmade pieces of jewelry. Max leaves about 12 tomorrow. If any of us want to go to the airport to say good bye ....be there at 10:30 in the morning. 50/50 won by Nancy....$26.00......it was passed on to Deepa.